My mobile HF install is complete....well sort of. 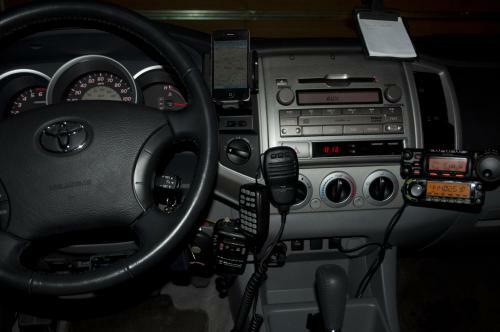 In the mobile I use to have a Yaesu FTM-350R, which is/was one of my favorite radios. A large display, APRS messaging, GPS tracking, 2 meter, 440 and 220 capability, and even cross-band (repeater-like) capability all make this an awesome rig to have in the mobile. The only real dislike I had was the mounting situation. I went through every possible mounting combination for the head unit - except for drilling right into the dashboard - which I wasn't going to do. Industrial strength double-sided tape, velcro, suction mounts, super glues, epoxies, you name it. Nothing worked! One big pothole and "bam! 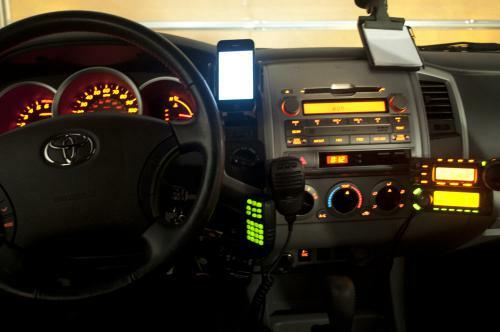 ", the head unit would come unmounted. I finally made a mount from an industrial-strength, glass carrying, suction device. Worked great. Well, a fellow ham was looking for a unit with APRS capabilities, and I offered to sell him the radio, GPS chip, and programming software - he got a pretty good deal. I already had a 2/440 analog and digital (D-Star) in the mobile - Icom ID-880H, but the activity in the area is pretty sparse. It's picking up, but we haven't hit mass penetration regarding D-Star yet. And I don't know where my fellow hams are on analog either. A call to several local repeaters during rush-hour, and nothing. Hopefully, newer hams to the hobby aren't experiencing that. Pick up the mic people! Or maybe nobody wants to talk to me - :) That could be a possibility. Hah! Given that, I continued on my quest for putting HF in the mobile. It gives me something to listen to while driving to/from work or just out and about. Connecting to a D-Star reflector, just isn't the same. I'm not one to link to this 'n that reflector or repeater. It's an option - and makes sense for reflectors - as I consider then "party lines". But linking from repeater to repeater - that's not really the purpose, unless you're attempting to contact somebody via call-sign routing. Plus, I figure while camping with the family, HF is an easy way to log some activity late in the evening once they've gone to bed - get's a little boring sitting around the fire by myself. As my HF rig, I installed a Yaesu FT-857D - which does 100 watts from 160m - 6m and includes 2m and 70cm - and it's all band (USB/LSB/CW/Packet/AM/FM/Digital). So I've got everything covered. I've run some "Hamstick" 20m and 40m tuned antennas and they work ok. But it's a pain to switch bands, by changing the antenna, plus carry all those with you. Kinda hard to do at 80mph driving down the highway! :) So I figured I'd wire up an antenna tuner. I had 2 choices....Purchase a LDG-type antenna tuner (which sits on the radio side), or something like the Yaesu ATAS-120 active antenna tuner, or configure an Icom AH-4 end-fed tuner. I almost pulled the trigger on the ATAS-120, but couldn't really figure out if I'd have enough space to permanently mount that to the truck and be able to get in the garage at night. I didn't want to leave it outside in the winters around here - I hate scraping ice and snow! Plus almost every review I've read said the antenna failed after a year or so due to bad seals, or the antenna failing to tune, etc. For almost $400, I didn't want to take the chance - it's gotta work - and the ATAS-120 seemed fragile. The LDG-type tuners were essentially out because I was very limited with regards to space. I wanted to keep the radio under the seat for easy removal if necessary. A permanant mounting situation was out of the question. The XYL wanted NO HOLES drilled at all - me either - I wanted a clean, easily removable install. So the LDG was out. Next came the Icom AH-4 with a Better-RF tuner control module and a 108" whip, I've even looked at the SGC military strength antenna tuners also. I've heard nothing but good reviews regarding the AH-4, the only issue would be mounting it close to the antenna. I also wanted to ability to remotely tune the tuner with the push-button tune control on the radio - that took the SGC out of the running. I would have to have a separate switch for the tune function. So the AH-4 seemed like a good way to do it. So I went for it and the family helped with some HRO gift certificates. I was able to mount this with no visible holes and got the coax and tuner control cable into the truck through a drain hole grommet under the passenger seat. Also ran the electrical through the firewall - another grommet - and figured 10 gauge wire was adequate - 8-gauge wire just seemed overkill. I grounded the AH-4, radio, and whip mount to the frame. I could touch with a continuity meter pretty much anywhere on the frame or body panels from any other point and it seemed all "connected". I soldered the coax ends on the cable (not my favorite job), mounted the whip mount, and went to hookup the Better-RF tune controller for the Yaesu radio and found out they shipped me the wrong one. Oh, damn! Almost complete. Well, I figured it doesn't hurt to drive around and listen. Which I did. I didn't dare transmit, so didn't even hookup the mic or set the tuner control in the radio. A couple days goes by and the Better-RF component comes in, and I ship the wrong one back. I hook it up, setup the tune control in the rig, and press tune. I run to the back of the truck and hear the AH-4 relays making noise - cool. Seems to work. I also don't see any indications of "High SWR" indicated on the radio - so all must be well....EXCEPT 1 THING...my noise level just jumped to an S-7. Ewwww. That's not pleasureable to listen to. I tried a couple other bands and still sounded pretty rough. I shut everything down and hooked up an antenna analyzer to see what I could see. Well the antenna was resonant at 30.5xx Mhz - then the meter swung heavily - totally off the charts no matter what frequency I attempted to analyze. Not good I thought. So I fire off an email to Alan Applegate (K0BG) - he runs an awesome HF mobile related website. He pretty much just re-assured me that HF mobile can get a little tricky....I figured I'm in it this far, let's just keep going. I ordered a mount for the head unit - since I didn't permanently mount it. I went with a Panavise cell/mobile device mount. Looks awesome, stays away from the passenger air-bag deployment zone, and show no holes at all. It's very sturdy and I have both the head unit for the ID-880H and the Yaesu FT-857D on it and it looks and feels like it could hold more. Very nice looking. I almost got the color on the ID-880H to match the rest of the instrument cluster. I love the 857D color schemes - anything you want you can match any environment. Regarding my noise issue, I'm going to experiment with some more grounding to see if I can quiet that down a bit and also ask some local hams that may have done some HF mobile work if they have any ideas. Below is the initial draft of this page before my mobile HF setup with the FTM-350R...left here for posterity. As you can tell from reading, some of my views on certain topics has also changed. After I got my "ham ticket", I had some pretty grandiose schemes and ideas about setting up a mobile ham shack. Oh, I was going to have VHF/UHF/HF/900Mhz, etc, etc, etc all while driving down the highway at 80 miles and hour. But then reality set in...it's just a lot of work getting all the rigs in there and wiring everything up. I like clean lines and a clean look to my cars. After all, it's got to be functional and getting tangled up in all the wires, mics, coax just didn't seem like a lot of fun. The other thing I found out through trial and error is that my total commute time being a whopping 10 minutes to/from work each day didn't really lend itself to productive QSO's at least for long distance. So getting that DX station or rag chewing over an extended period of time wasn't very feasible. So I decided to keep my QSO's local and figured that VHF/UHF and maybe a D-Star unit in the future would be the best fit. 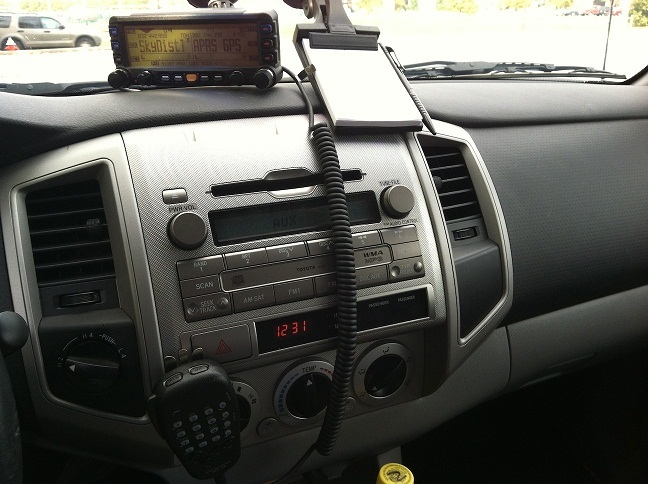 So I picked up a Yaesu FTM-350 with APRS capability and added the GPS chip (see my APRS page for more info on that). I drive a Toyota Tacoma and love the truck. It rocks! It's got plenty of room and I was able to keep all the radio gear and lines all clean as you can tell below.